Ok, do these in order. 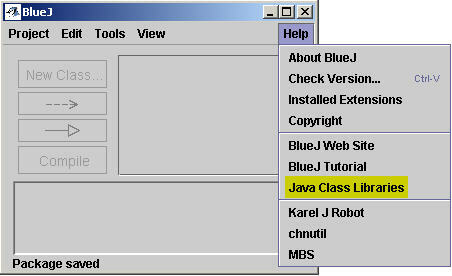 These steps will enable you to get all files you'll need to write programs in Java and use BlueJ to do so. 3. Create a folder on your hard drive that you won't move (I'll use c:\javaStuff for all of my examples). 4. 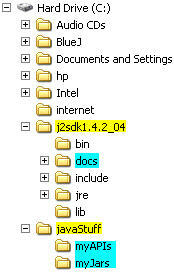 Unzip this zip file of jars right into the c:\javaStuff folder. 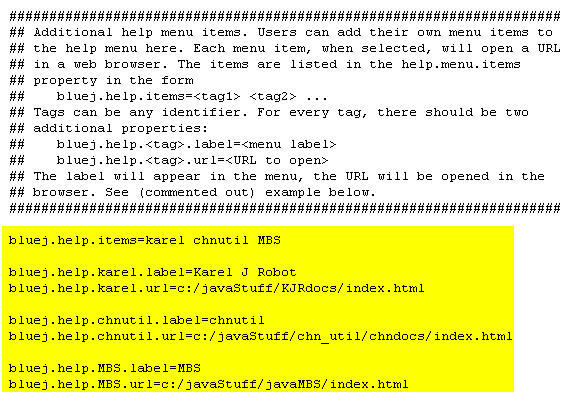 You'll now have a c:\javaStuff\myJars folder with all the jars in it. What's in the jars zip? What is zip? 5. Unzip this zip file of api's right into the c:\javaStuff folder. You'll now have a c:\javaStuff\myAPIs folder with all the APIs in it. What's in the api's zip? step 1(it's called something like c:\j2sdk1.4.2_04). It'll create a docs folder. Ok, physically, your computer has what it needs. BlueJ will now run. 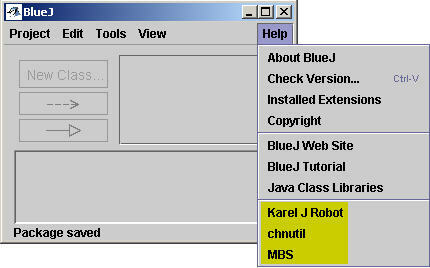 In order to use your own jar files you'll have to enable BlueJ to see them. There are different ways to do that; I will only give you what I believe is the easist way. 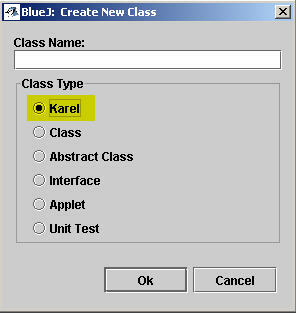 BlueJ works on a folder system; everything that is part of one project must be in a single folder (that's a good thing). If you have any jars that the project needs, just create a "+libs" folder within the project folder and put any jars you need in it. 3) click on "open in BlueJ"
note: from now on, it's a BlueJ project (you'll see some other files in your folder now - they're for BlueJ). When you go to open this project the next time, just do a normal "open project..."
The .tmpl files control what a default class, interface, abstract class, etc. will look like when you choose "New Class". This is fine if you have a fast connection and your lab is always connected (don't I wish). and change the URL to the location of the index.html file for the API. What's in the jars zip? What's in the api's zip?